WHEY PROTEIN is dead! Long Live Whey Protein! Serious bodybuilders, sports athletes and fitness enthusiasts of the future will soon shift to AMINONUTRITION. Very tedious to prepare: which means less time spent on workouts. Takes long time to get digested: body feels very heavy during workouts. …and takes time to show results: what if you want to reduce fat and develop the killer bod in 3 months? That’s why the best people in the fitness industry are shifting to free form amino acids for improving performance. 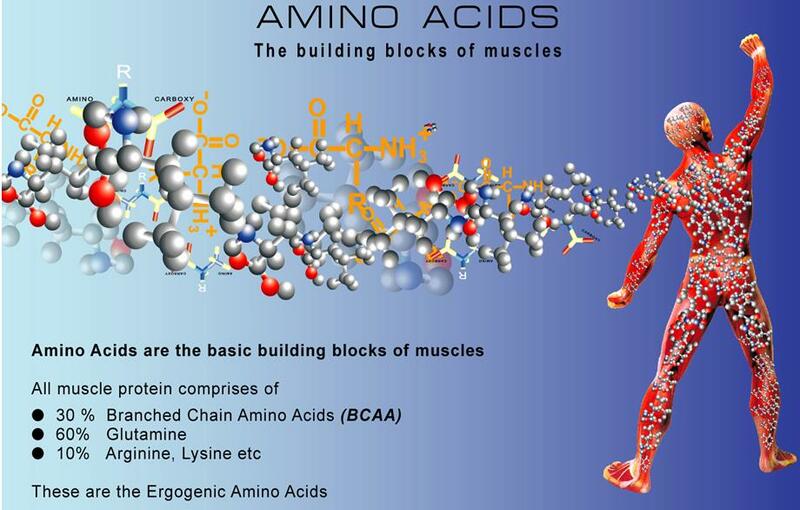 Proteins which are known as the building blocks of life are made from the bonding of amino acids. The human body requires 20 amino acids which are the building blocks of proteins and the “construction material “of muscles, vital organs and virtually every other part of your body’s lean mass. However, some specific amino acids – GLUTAMINE, Branched Chain Amino Acids (BCAA), Lysine and Arginine play a very important role in the muscle structure and growth which enhances PERFORMANCE! Scientifically these are called Ergogenic Amino Acids (EAA) and the performance of your body is directly related to the amount of EAA found in the body during performance. It is very clear that Performance Nutrition is also called AMINONUTRITION. So, if you are planning to burn fat from your body, lift heavy weights to develop bulk with lean muscle mass or to develop rippling well defined muscles ( Daniel Graig look) then you need to fuel your body with the right type of Ergogenic Amino Acids in the right quantity and the right time. The time of an intense workout usually ranges from one hour for a gym workout to longer hours for competitive sports. During this period the muscles require scientifically balanced nutrition which can be delivered at an accelerated rate to the working muscle. Scientific studies have shown that pre and post supplementation with free form of Ergogenic Amino Acids enhances stamina and mental focus. Aminonutrition should be taken 15 min before workout for intense power during workouts and immediately after the workout for during the muscle recovery time for maximum benefit. Today, Sports Coaches, Persoanl Trainers and Gym Owners all over India are beginning to realize the importance of AMINONUTRITION as the most effective and safest nutrition available in market today. Visit our website www.bodyfuelz.com to know more. You can also call us at 044-42014141, mail us pmt@bodyfuelz.com or drop your comments here to know more about how Aminonutrition can help you to reach your fitness goals. This entry was posted on February 18, 2009 at 1:17 pm and filed under amino acids,AMINONUTRITION,health and fitness,life,Nutrition,Weight loss,whey protein. You can follow any responses to this entry through the RSS feed.